Q75. Are automobiles good or bad? 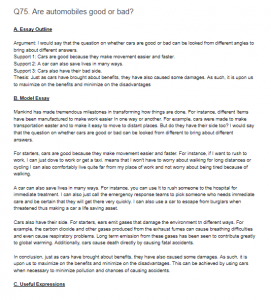 Argument: I would say that the question on whether cars are good or bad can be looked from different angles to bring about different answers. Support 1: Cars are good because they make movement easier and faster. Support 2: A car can also save lives in many ways. Support 3: Cars also have their bad side. Mankind has made tremendous milestones in transforming how things are done. For instance, different Items have been manufactured to make work easier In one way or another. For example, cars were made to make transportation easter and to make it easy to move to distant places. But do they have their side too? I would say that the question on whether cars are good or bad can be looked from different to bring about different answers. For starters, cars are good because they make movement easier and faster. For instance, if I want to rush to work, I can just dove to work or get a taxi. means that I won’t have to worry about walking for long distances or cycling I can also comfortably live quite far from my place of work and not worry about being tired because of walking. A car can also save lives in many ways. For instance, you can use It to rush someone to the hospital for immediate treatment. I can also just call the emergency response teams to pick someone who needs immediate care and be certain that they will get there very quickly. I can also use a car to escape from burglars when threatened thus making a car a life saving asset. Cars also have their side. For starters, ears emit gases that damage the environment tn different ways. For example, the carbon dioxide and other gases produced from the exhaust fumes can cause breathing difficulties and even cause respiratory problems. Long term emission from these gases has been seen to contribute greatly to global warming. Additionally, cars cause death directly by causing fatal accidents. In conclusion, just as cars have brought about benefits, they have also caused some damages. As such, it is upon us to maximize on the benefits and minimize on the disadvantages. This can be achieved by using cars when necessary to minimize pollution and chances of causing accidents.